On July 19 2009 Richard and I arrived in Santiago having walked 254 kms to complete our Camino de Santiago. What an extraordinary journey it has been and what delightful people I have met along the way. People who have inspired me to be better in the world by demonstrating high levels of humility, determination and generosity. Walking is a wonderful way to spend time, it provides room for thinking and expansion whilst moving with purpose, what could be better? Except perhaps the siesta after a day of hard walking. Thanks to Roland, Laurie, Darren, Joy, the French family, the senora who gave us juice for breakfast and all the others we met along the path. A beautiful adventure. 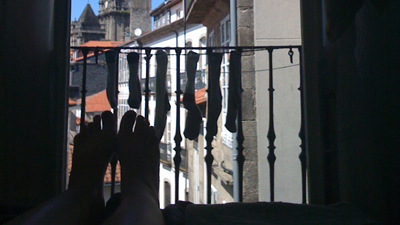 This entry was posted in Documentary and tagged camino de santiago, contentment, expansion, richard, spain, walking. Bookmark the permalink. Hi Michaela! I didnt have your emial to show you my stop motion video i made but i thought id send you the link on your site 🙂 I hope it works! I enjoy the way you write, poetic, deed… it is like I hear your voice! Again contratulations on finishing this wonderful inner and outer journey!